Learn the secrets of funk and R&B guitar styles. 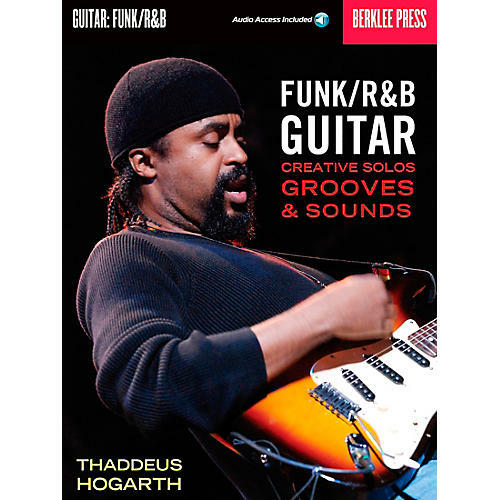 The Funk/R&B Guitar - Creative Solos, Grooves & Sounds book and CD set has hands-on funk guitar lessons that include exercises, licks, and technical discussions that will help you play in the style of Kool and the Gang, Prince, James Brown, Sly and the Family Stone, Jimi Hendrix, Curtis Mayfield, Soulive, and other great artists, spanning from old school to contemporary funk and R&B grooves. The CD features demonstration and practice tracks, played by the Boston-based R&B/funk group the Thaddeus Hogarth Band. Guitar tablature, fretboard diagrams, and traditional notation are included. You'll learn how to play lead lines and build solos; understand and use scales over funk and R&B harmonies; create rhythm-guitar parts that support funk and R&B grooves; bend strings to expand your palette of scales, harmonies, and ornamentation; and much more! Get down and funky. Order today.